New things are good – I like them. Crave them, even. 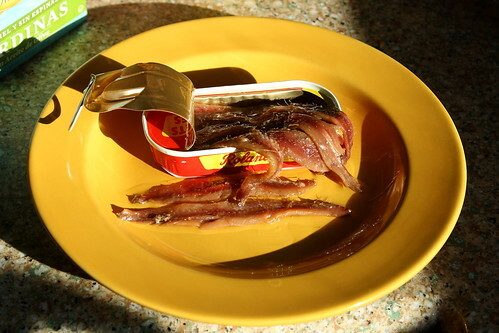 I’ve never in my life had anchovies or sardines (to the best of my knowledge.) At least, not as meat-like entities – I’ve had them in sauces and dressings, I’m certain. My mother was never one to use non-standard cuts of meat. We never had organ meats, oxtails, anything along those lines when I was growing up. She has moderate OCD, and part of the way it manifests in her is in what and how she will eat. The second she finished her meal, anything left on the plate became “garbage.” It seemed funny at the time, but what a wasteful and ungrateful way to perceive food! As if sweet and sour chicken, burritos, teriyaki salmon, curried lentils and chicken shwarma were all somehow in the same food group. ANYhow, we did not have anchovies in our house, in our sauces, or on our pizzas. I heard a bit on NPR awhile back about eating lower on the ocean food chain, and all of its benefits. It’s not a concept new to me, but it was good reinforcement. Sustainability is important for our food, fish are very nutritious and since little fish live shorter little lives, they accumulate fewer toxins in their bodies (unlike the larger, predator fish such as tuna and salmon.) Of course, those larger, far less sustainable fish are also a lot tastier, in my opinion. Maybe I just wanted the pretty tin. I don’t know. Don’t judge me! The lid of the tin contained an important bit of advice, particularly after the fishy smell hit me upon opening it. To my uncultured nose, what I was getting whiffs of smelled like cat food, straight up. My fingers had gotten all oily just from opening the tin. We were not off to a great start, no sir. But it was still pretty, and still vintagey, and I wanted to like them, so I sallied bravely forth. Getting oil all over my hands in the process. Lifting the little fishes out of their can did not help things any. No, in fact I’d say it made matters rather worse. What I had forgotten was these fish have such tiny bones, they don’t warrant removal. Appetizing? No, not so much. I set the fork down for a moment, regarding the bones as they regarded me. I suspect their distaste matched my own. You can’t really see the bones too well in the photo above, so let me get in nice and close for you. There was nothing to be done for the bones, so I speared a little guy and popped him into my mouth. And chewed. And swallowed. So… salty! So oily. So fishy. Well, I’m not sure what I expected, given it is oily fish in olive oil with salt added. Quelle suprise, right? 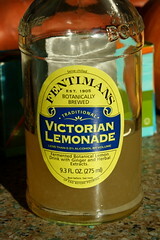 Thankfully, I had a very potent beverage at hand with which to wash down the overpowering flavors. Maybe I just wasn’t properly prepared. I mean, I’ll try anything two or three times, just to make sure I didn’t do it wrong the other times. I took another fish, chewed it up and swallowed it, and promptly drained the last of the fermented lemonade in one long gulp. 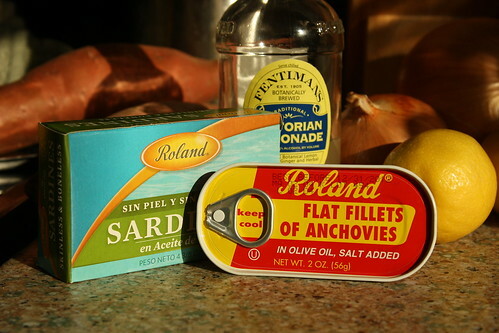 This lovely little tin of sardines is going to have to wait for another day. Sardines are larger fish, and I would imagine there may be more substantial bones with which I’ll need to contend. Although I just noticed the “sin espinas” bit, which means “without bones.” Yay. I suspect perhaps the tiny fish family is not necessarily made to be eaten by themselves, and that they might do better on or in something. 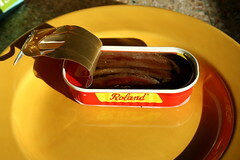 I’ll look into recipes, because I still have a whole tin of open anchovies (minus two) to contend with. This is not to disparage those of you who enjoy your tinned fish – not at all. I envy you your lack of mental blocks concerning these products. Perhaps at some point, I’ll be able to join your numbers. What do you do with your tiny little salted fish? 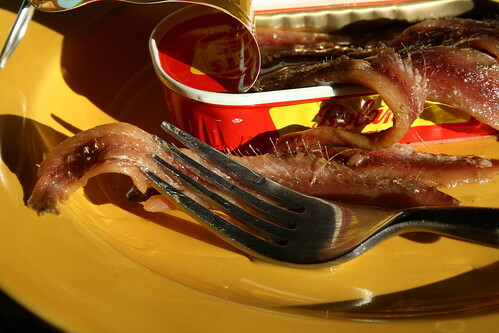 Soak the anchovies in milk for an hour or two before using to remove most of the salty taste. 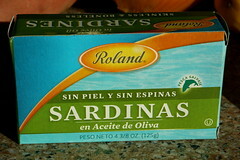 Sardines, make a great sandwich, for those of us able to eat buttered bread. 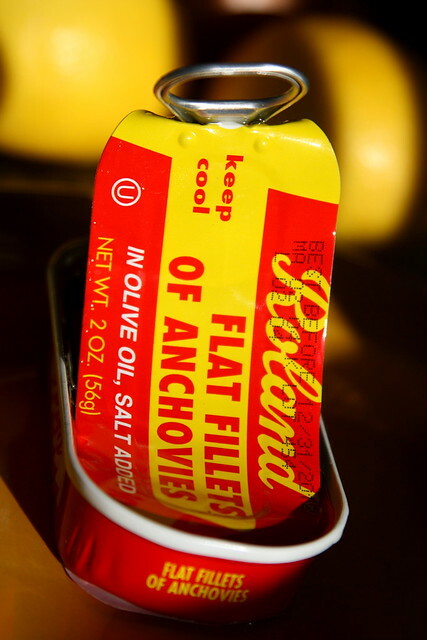 Anchovies do amazingly well cooked into olive oil. Fry them, crush them with a spoon, and they will break down completely, yielding a lovely meaty flavor throughout the oil at odds with their apparent fishiness and saltiness. Great for pasta with garlic and oil, or other Italian sauces. I’m going to look for recipes today.